What’s the Project? 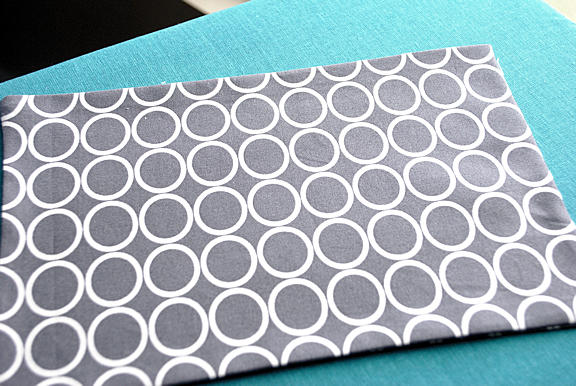 This messenger bag pattern is perfect to make for the kids whether it’s to take to school or dance. It’s a fun pattern to make and turns out so great. 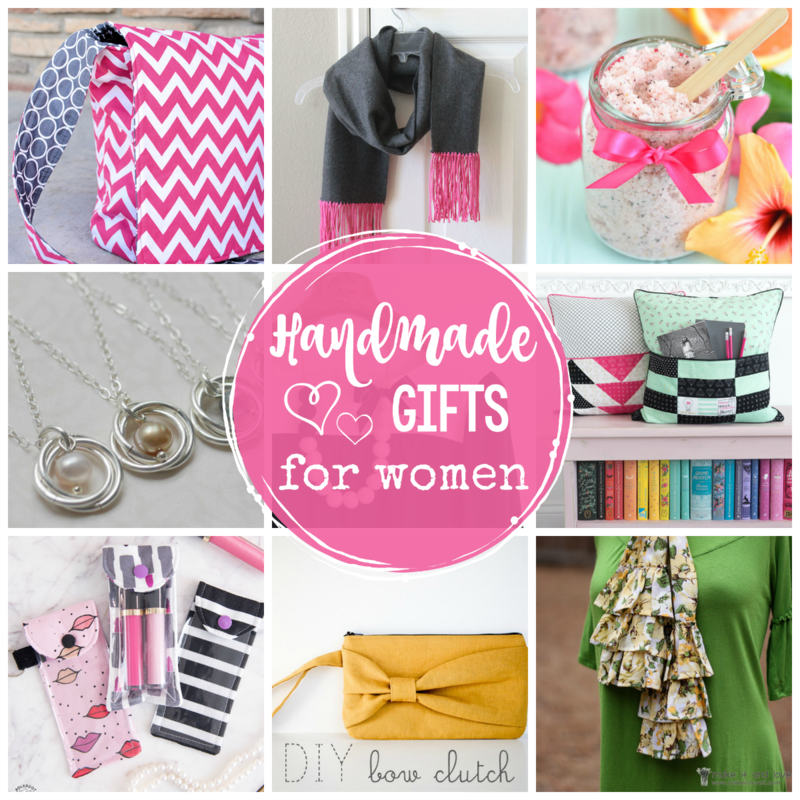 Perfect for girls or boys, kids or teens or even for college! This bag is very similar to my all-time favorite project on my blog, the Messenger Bag (adult version), with a few changes. I’m not going to show you the personalization part in this tutorial. 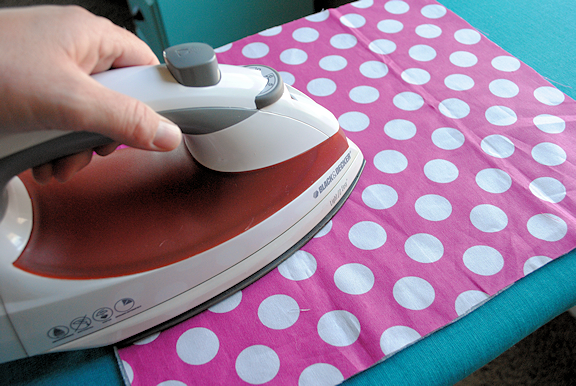 I have a separate tutorial for how to use heat transfer vinyl here. Let’s start this out by cutting out our pieces. 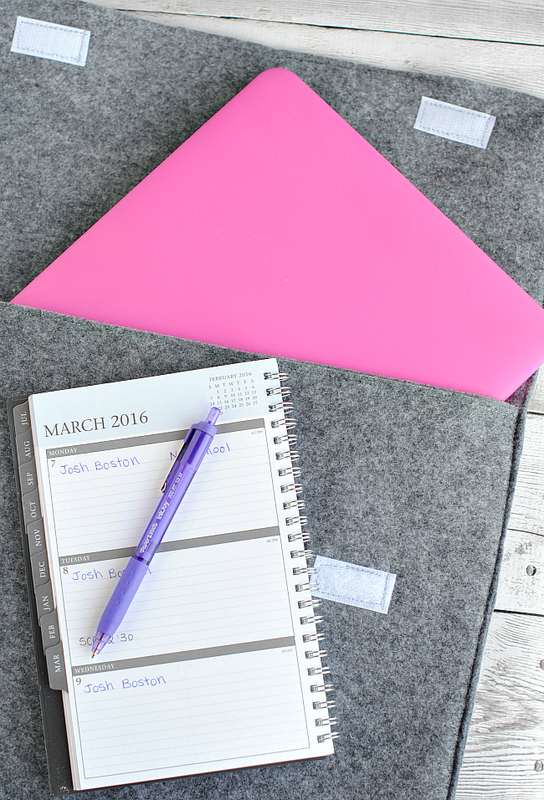 Now iron the fusible fleece to the back of your big 12″ x 14.5″ piece as well as your long 6″ x 38″ piece. 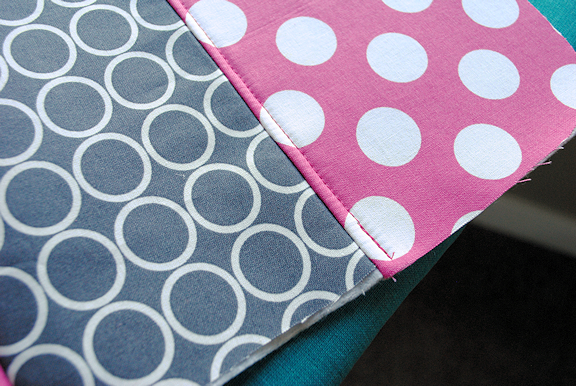 Stitch the flap piece that you already sewed to one of these 12″ x 14.5″ pieces to form the back of the bag. Now, get your piece of lining fabric that creates the back flap and position this pocket where you want it. Do it just a few inches up from the bottom of it. Sew all the way around the 2 sides and the bottom leaving the top open. 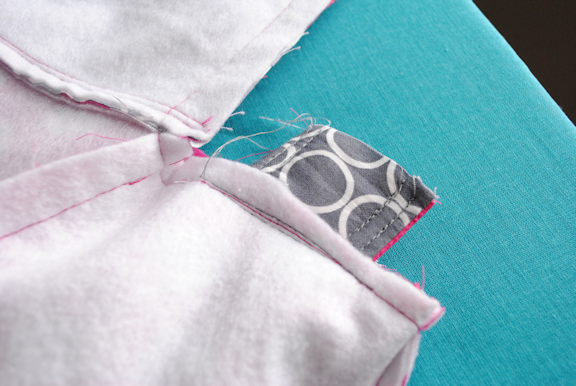 If you want to create some compartments just sew vertical lines down the pocket with the spacing you want. Now follow the same instructions that you followed to assemble the outside of the bag to assemble the inside. Once you have that done turn the lining RIGHT SIDE OUT and the outer part INSIDE OUT. And insert the strap so that it is between to the two layers and sticks out the end. Be careful that it’s not twisted inside the bag. Now, starting at the top of the flap sew around the flap, across the front of the bag and back up the other side of the flap leaving a small opening at the top to turn. Here’s a video showing the process. This is the same process for about 5-6 tutorials on my site, so I’m showing it with the mini messenger bag in the video but it works the same for all of these different tutorials. Now turn everything right side out and stuff the lining down into the bag. Press it all nice and flat. I like to topstitch along the flap and the front of the bag to keep everything nice. And you’re done! Want to personalize it? Follow this tutorial here. This bag is adorable and will make a great gift for one of my granddaughters. Thank you! Fabric purchased. Machine set up. Nerve to make the first cut… yeah, not quite there! But I’m working on it! Thanks for the great tutorial. The finished size will be about 13.5″ wide. Yes, I think you could definitely use that duck fabric to make it sturdier! Good idea. I still think you might want the fusible fleece. It would be a little bulky but very sturdy. Just finished with duck fabric and fusible fleece. Is definitely not too bulky. Need extra sturdiness. one more, I have everything cut for 3 bags, but I want to check before I start, what is your seam allowance? I was guessing 1/2 inch? Yup, I do about 1/2 inch. Can you tell me what fabric line you used for the bag? The patterns are very cute! I’m a novice to the sewing world, and wanted to thank you for clear and concise instructions. You made me successful at the project! I did change one thing in making the bag for my girls. I added a section the same width as the gusset to the flap so that the accent would lay on the front of the bag. Super tutorial, and the bags came out super cute too! I see the width of the bag in your return comment above as being 13.5 inches. What is the height and depth? I am thinking of making this into a DSLR camera bag and another for a purse. 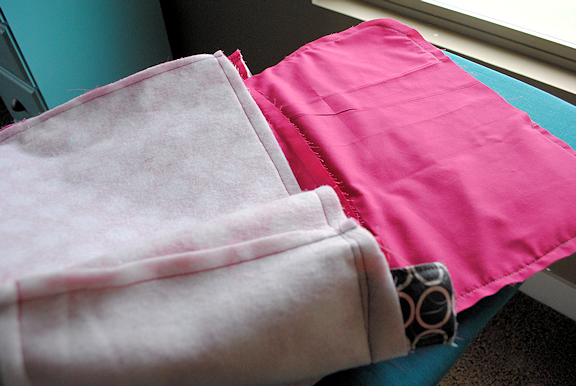 I plan to add pockets on all 4 interior sides for organization. Also, what are the dimensions of your adult sized bag, for my future reference in case I decide to make that one too. This one is about 4 inches deep and 12 inches wide. Thank you. The directions and photos are Great! Just to clarify the finished sizes. Adult 16 wide x 14 high x 4 deep. Kids 13.5 wide and 4 deep by what height? Is this correct? I just finished 2 bags for my nephews. They look good bt I’ve struggled with the corners where the flap meets the bag. When I turn everything and flip it in place it pulls/bunches up in those corners. Any ideas on how to make it lay flat? I may be making few more and would like to solve this issue. Nice pattern.. Thank you for taking the time to make it. I have that problem sometimes too. The main key is just to click the curves before you turn. Did you do that? I’m about half way done and about to see the lining pieces together. One question, do you sew right side pieces together for the lining as well? For some reason I’m really stuck on this. Thanks! Yes, for the inner part do the exact same thing that you did for the outer part. Made one so far, getting ready to make the next 2 but need to downsize it a little more for an almost 3 year old…..she has to have everything the other girls have ;) any suggestions? Size down the main piece and then adjust the others accordingly. I would just move each side in an inch or two and the top down an inch or two. Does that make sense? Hi, I have never sewn anything but the most basic things (and not very well); this is the first actual project I’m going to tackle. That being said, what kind of fabric do you recommend? It’s going to be a small diaper bag. Just get a regular cotton. Not knit and nothing too heavy for your first try. So happy to say that I successfully completed this project. I haven’t sewed since junior high home economics. Got a sewing machine for Christmas and finally found some time to sit down and use it. My niece had a messenger bag on the mind so this was absolutely amazing to find. Thanks so much. This is a very nice bag, gonna make a couple just what I was looking for. 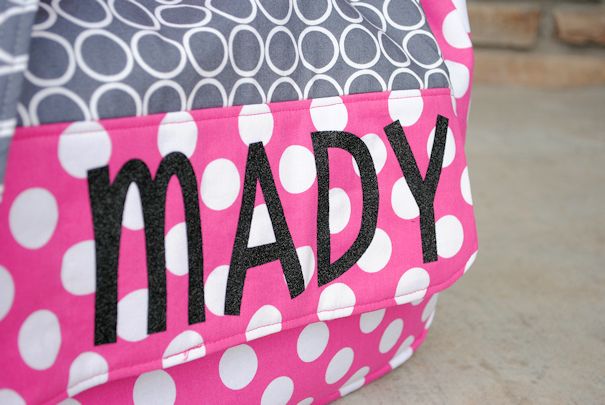 please say hello to Mady for me – I was a Mady at a time when no other little girls were named Madeline or Mady and the spelling M A D Y is still unusual. My mom wanted to name me Gabriella – dad wanted to name me after his favorite cousin. Mom agreed but only if I was called & spelled Mady . . . we’re special~! I love that name! This is actually a neighbor’s daughter but man, if I had a little girl, I would love her to be Mady! 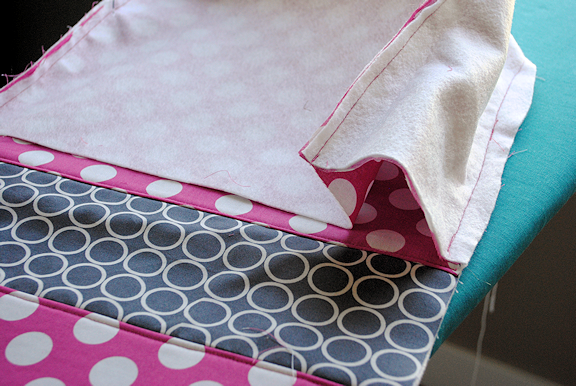 You could use batting but the fusible fleece is easier to work with. I’m having an extremely difficult time figuring out how to see the lining to the practically completed bag…. Is there a way I can contact you? Maybe I don’t understand your directions or measurements but my fabric is way off. The piece that is supposed to be 6″x38″ is about two inches long and the piece that will be the back of the bag is about an inch too short, my outer side piece doesn’t fit… am I doing something wrong or should it be 6″x36″ and the back piece (s) should be 13″x14.5″? I gave you a long measurement for the 38″ one because it is easier to cut off the excess than run out of fabric. So just snip the excess off. If you are short on the back then go ahead and add in that extra inch if needed. I had the same issue with the lining being too long. I think it had to do with the seam allowances for the front of the flap. I trimmed the lining to make it work but I think next time I’ll account for the seams and make the front of the flap longer. I also had the problem of bunching where the flap meets the bag. what do you mean clicking the curves before turning? Take your scissors and snip tiny lines into it right where the curve is. Snip right up to the seam is but don’t cut it. Hi Amber I love all the beautiful things you make. I was wondering if you could tell me if the Messenger Bag would be strong enough for a university student to take her laptop and other things they would need to uni please. I do it on the inside. I’m really wanting to make THIS bag out of assorted feed bags( the type of bags that resemble tarps if anyone understands what I’m talking about) not sure, however of what I should do about a lining material. Any ideas??? I’m thinking this would look super cute with a rabbit pellet bag… The flap would contain a picture of a bunny. Do you mean just the fabric for the inside of the bag or the interfacing? I think you might not need interfacing since your fabric is thick. Inner fabric though would be good with anything!! Thank you so much for this tutorial! I used it as an inspiration while making a diaper bag for my sister! 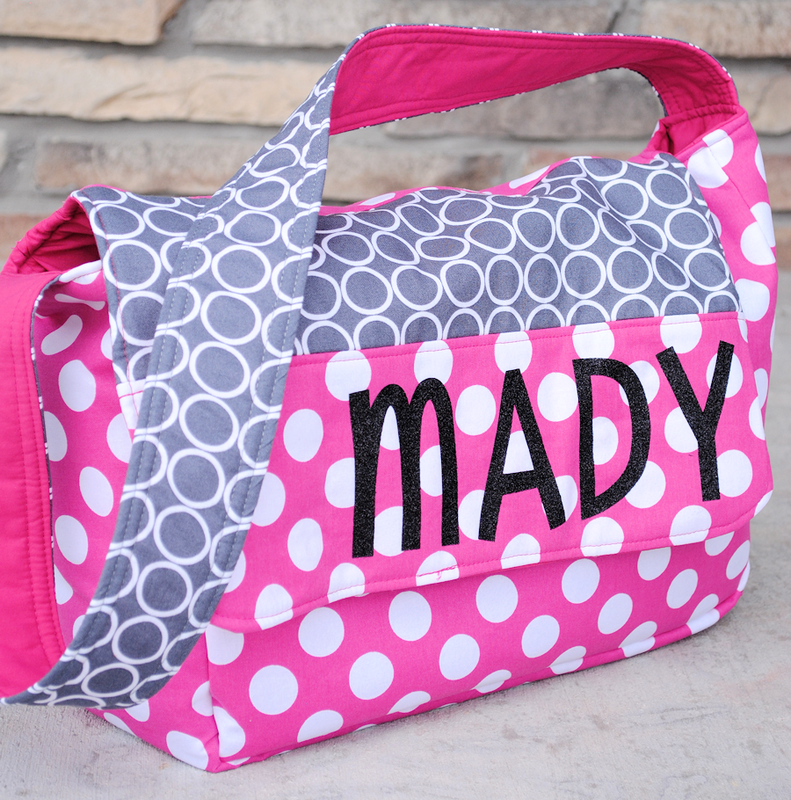 See how mine turned out at http://www.happymamatales.com/diaper-bag-tutorial/! I want to make this size bag as a cross body purse for myself, however, I want the front flap to go all the way to the bottom, what adjustments do i need to make for that. Also, I don’t want such a deep bag, would it work to make it 4″ in stead of 6″? Thanks for the tutorial. I really do love this bag! Adorable, I always wanted backpack for little boy with name on it, went with monogram instead after talking to a friend who said she remembered news article warning mothers against backpacks and shirts with kids full names on it since could give a perp ample opportunity to have reason to talk to kid if knew name, just thought I would let you know, I really do love the bag and colors, might do something for my sons books with just monogram though. Amber – thank you so much for this tutorial. I had a very difficult time with the flap also. Tried multiple times to get everything lined up. Here is a much easier suggestion for completing the flap. 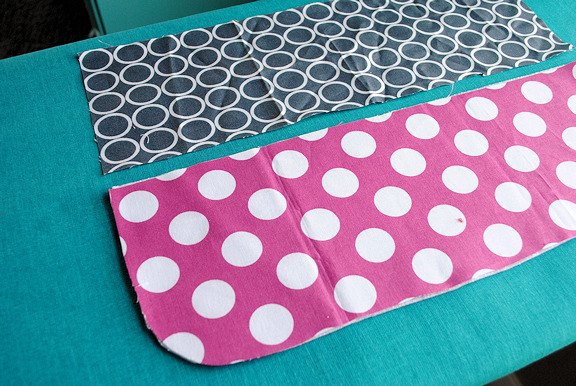 Sew the flap as a separate unit first – assemble the outside of the flap but don’t attach it to the bag. Then lay the lining piece face up, top with the fleece, then lay the outer flap piece face down. 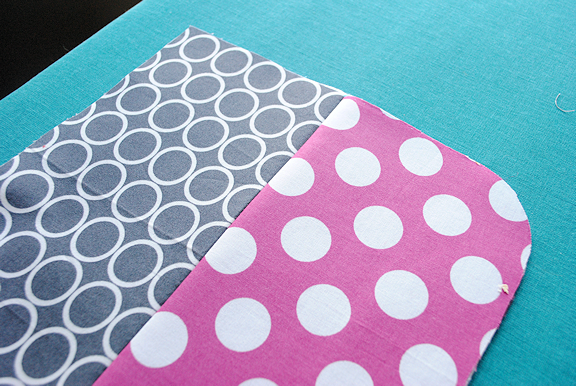 Sew the layers together around the two sides and the rounded edge. Trim the curved sections of the seam to reduce bulk and then turn right side out, smooth down the edges and press. Then assemble the outside and inside of the bag (being sure to leave the opening for turning), per your instructions, leaving the back unpinned. Now to insert the flap (still turned right side out) – take the completed flap and pin it between the outer fabric and the lining making sure to match up the fabrics. Then simply sew all around the top edge. Turn bag right side out through the opening left in the seam of the lining fabric. You can press the top seam prior to turning if desired; it makes a smoother line at the top of the bag. You dimensions are perfect and the flap fits into place perfectly. 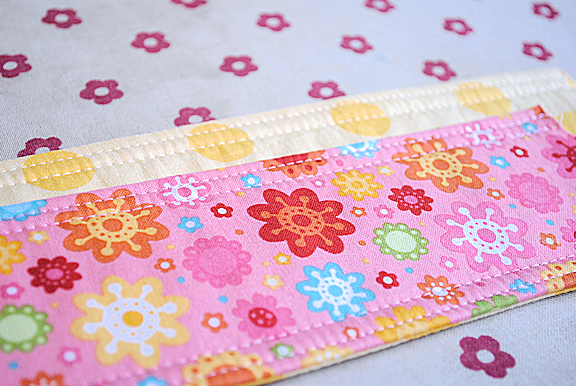 If desired, top stitch all around the top edge including around the flap. 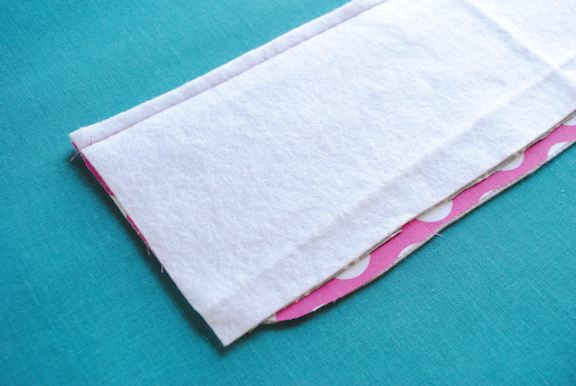 Do you apply the fusible fleece to the outside and inside (the main fabric on the outside and the lining inside) of the bag? 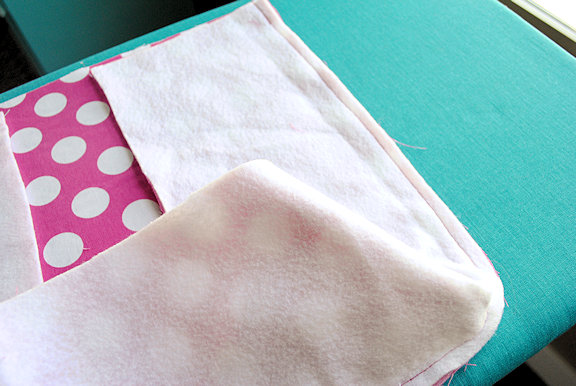 It says you only need 2 pieces of fusible fleece in the directions, but if it goes on all the panels, lining and outside, wouldn’t you need 4? I only do it on the lining fabric. So just one layer of fusible fleece. ok thank you so much! Finishing it now :). My little girl is soooo excited! She’s helping me make it! I have purchased all the fabric needed and cannot wait to start this bag. My only question is how did you decide how large to make the curve? Just eyeball it. Just a gentle rounding. I used one of my kid’s cups to make the mark for the rounded curve. I really love this bag. Can you tell me how big it is once it’s finished? Also, I would like to add foam to the bottom instead of fusible fleece, how do I do this? If it’s big enough I’m going to make it as a sewing machine bag for my son’s sewing machine, it isn’t very big. Thank you so much for this wonderful tutorial. I hope this is the pattern I’ve been scouring the net for. It’s about 13-14 inches wide by maybe about 10 inches tall and 5 inches deep. To add the foam you would have to just stuff it down into the bottom after you turn the two layers the right way and before you sew it shut at the end. So glad you’re still responding to comments. I’ve cut out my pattern pieces are for the life of me I cannot understand what the 10.5 x 14.5 lining piece of fabric is for – can you help me out? Is this the reverse side of the front/bag flap? Is the strap not made from the accent (grey) and lining (solid pink)? It says to cut the strap from the main fabric as well as the accent, but that’s not how it appears in the pictures. 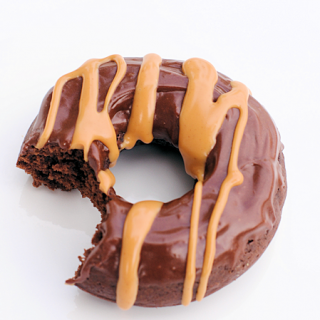 You can do it however you like it really!! What kind of cloth did you use…. can you please tell the name? like we have.. cotton, duck cloth… etc. I used just regular cotton but you could use anything really. But the outside part is already inside out right? Is it between lining and outside part? Did anyone else find that the 6 x 38″ piece between the front and back on the outside and lining are too long? Do you make and sell these bags? This is a super cute idea. :-D I was just wondering, Would felt work instead of the fleece? And how easy is it to make?because I’m 12 and love sewing and would like to make this. One last question, do you have a pattern foyr it? I think felt could work? Not sure? It’s probably a moderate level project. Thanks for the great pattern! Made it in a soft corduroy with a silky accent and it turned out great. Put some pockets under the front flap and on the inside as well – who doesn’t love pockets? Hi! I am completely new at sewing and my first project was the mini messenger and it went great. Where can I find the pattern for this kids messenger bag? Hi. I was wondering if this would be big enough(but not too big) to use as a teen’s dance bag? It at least needs to hold two pairs of dance shoes, clothes, and a whole bunch of hair accessories and makeup for contests and recitals. If not, do you have a bag that will? I think this would be just right for that probably! Adorable bag, I want to make messenger style library bags for my kiddos. Do you have pattern for that? How would the pattern be affected if I used fuseable interface on the lining too? That will work-just will give it a little more bulk. I am wanting to make this bag for my grand daughter to use as a lunch tote. I am seeing that it it 13.5 wide and 4″ deep. What is the height? I can’t wait to shop for cute fabric!! Thank you for sharing your tutorial.